This is the latest entry in an ongoing anthology series of original stories inspired by the work and worlds of weird fiction author H. P. Lovecraft. Renowned Lovecraft scholar and editor S. T. Joshi has thrown together an impressive roster of contributors, including Caitlín R. Kiernan, Simon Strantzas, Fred Chappell, Cody Goodfellow, and the late Melanie Tem. Despite the literary clout of some of these names, however, the overall quality of the stories is quite varied. There are some truly powerful stories in here. Several stories in, Richard Gavin’s beautifully disturbing “The Rasping Absence” follows a journalist’s descent into madness as he comprehends humankind’s pathetic fragment of existence in a universe full of dark matter. Immediately following this story is Caitlín R. Kiernan’s sensational “Black Ships Seen South of Heaven,” a grim and horrifying glimpse at a world in which Lovecraft’s slumbering cosmic entities have risen and taken over. Ann K. Schwader’s “The Night of the Piper” is a wild tale set in the American southwest, in which a young woman discovers the terrifying origins of the Native American deity Kokopelli. And Simon Strantzas’ “In the Event of My Death” is a beautifully morose tale of a man’s dark discoveries following the death of his mother. There are other memorable tales, including Darrell Schweitzer’s “A Prism of Darkness,” in which the 17TH century mathematician John Dee experiences the terrifying power of Lovecraft’s classic fictional grimoire, the Necronomicon. Some tales, such as W. H. Pugmire’s “Half Lost In Shadow” and Fred Chappell’s “Artifact” are pastiche-heavy, trying (at times, too hard) to emulate Lovecraft’s style. Others have little to do with him but for a shoehorned-in token reference to his various cosmic entities. Other stories simply have little or nothing to do with Lovecraft’s themes or style at all, making their inclusion somewhat questionable. Take, for instance, Cody Goodfellow’s “Broken Sleep,” a surreal tale of a young man’s trips from one horrifying dream into another. There are no overt Lovecraftian references or themes, save an overall vibe of cosmic unease. A similarly problematic example is Melanie Tem’s “Trophy,” a bizarre story of a man’s disturbing recovery from a dismembering accident—and his belief that an alien baby is growing inside of him. Although mesmerizingly written, how it has anything to with Lovecraft, much less why it was included in this anthology, is beyond comprehension. And then, some tales are simply not that memorable. Some end very abruptly; others unfold in an all-too-predictable manner, with plot points that are lifted from classic tales (some Lovecraftian, others not). This anthology probably would have benefitted from a more thorough selection. As it is, it serves as a typical example of the hit-or-miss nature of multiple-author short story anthologies: it has its strong points and its weaker ones, but the latter largely outweighs the former. 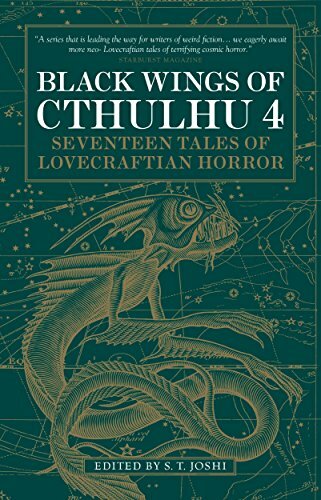 Newcomers to the Black Wings of Cthulhu series would do best to read the preceding volumes, and leave this latest installment to a completist’s scrutiny, be it for the series or for any of its contributors.